So, me and Jevaho went to the movie theatre some time ago to see Total Recall. 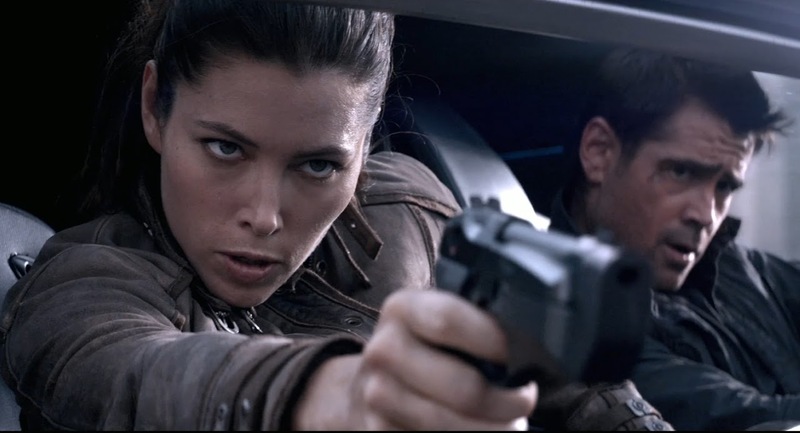 There was Jessica Biel, Kate Beckingsale and ... ehm... euh ... lemme think... Anyways, there were also some kickass guns which we liked. The idea started rolling to build one of them guns. 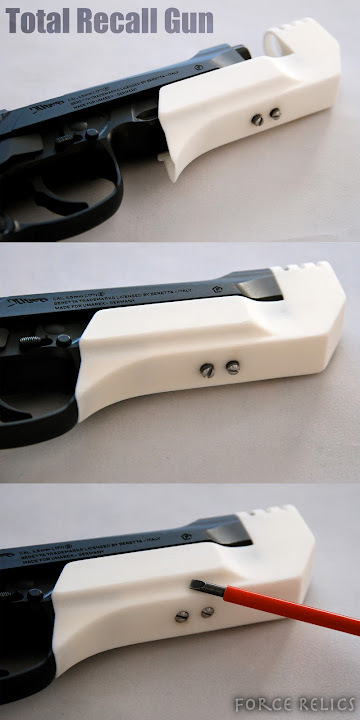 The first one that jumped was the modified Chiappa Rhino 50DS. This proved to be a too big a challenge for now. 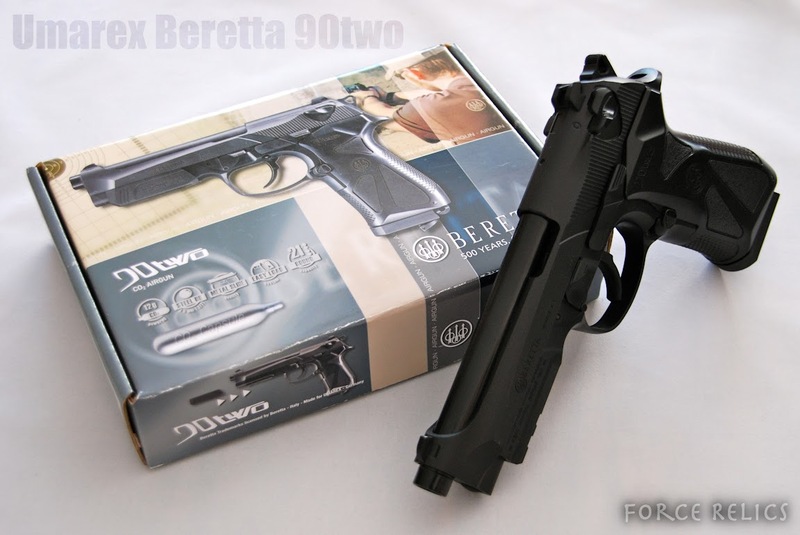 The other one that came to mind was the 'Jessica gun' which was basically a Beretta 90two with a custom compensator. After some research it turned out Umarex had one of these in a 4,5mm steel bb version. 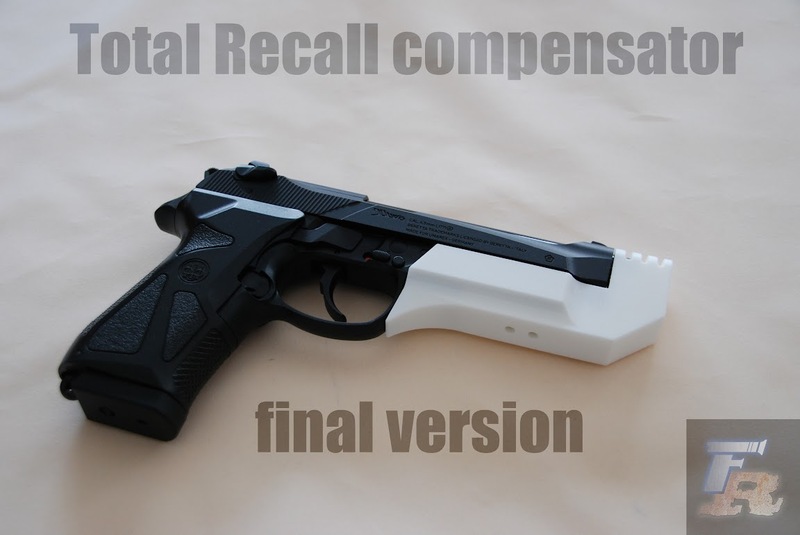 The idea to have a shooting Total Recall gun proved too much fun and so the Total Recall Beretta 90two gun prop came to life. 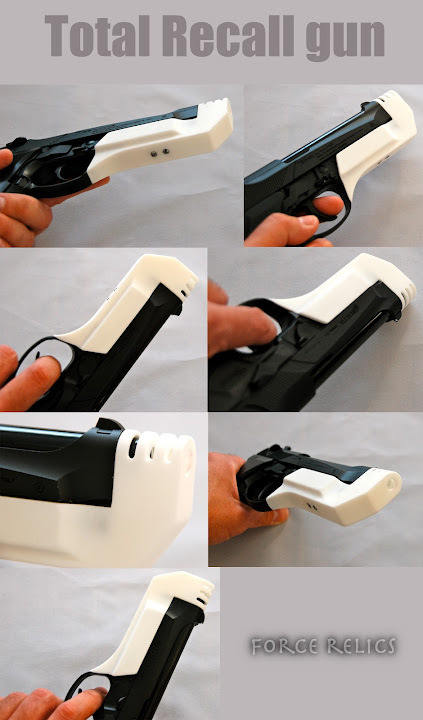 After the Beretta was bought i spent about 1,5 week or so measuring and 3D modelling the compensator. 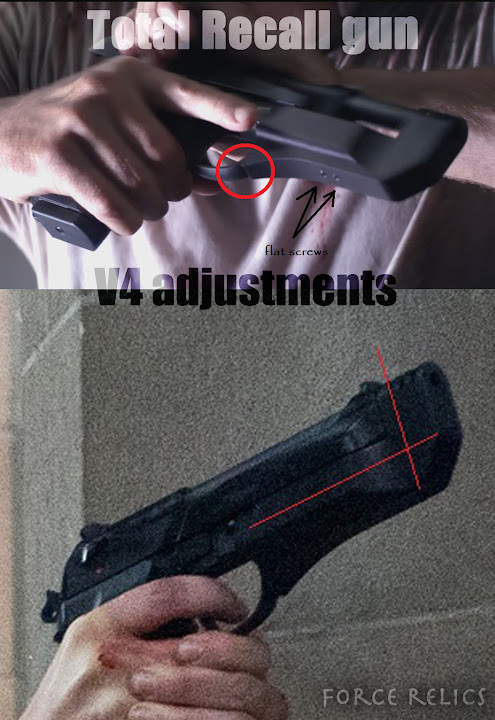 It proved a bit of a challeng as the Beretta had moving parts (no blowback) and i wanted to keep it moving smooth with or without compensator. First the CO2 piercing screw was cut and made into a flathead screw. A very easy mod, if not the easiest i've ever done. Secondly, there were some 5,5mm holes drilled where the 2 set screws need to sit in to keep the compensator in place while firing. 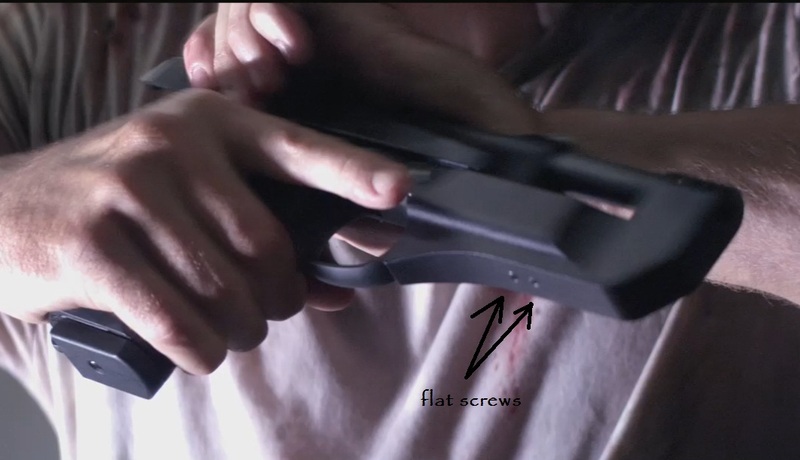 Also when aiming for screen accuracy the screws were probably there for that same reason. Determining where these holes needed to be made was done in a later stage of the build. Made 2 custom M5 steel set screws. These were made from standard cut down black steel bolts. Jevaho will bring his gun bleuing stuff over sometime to get hem black again. 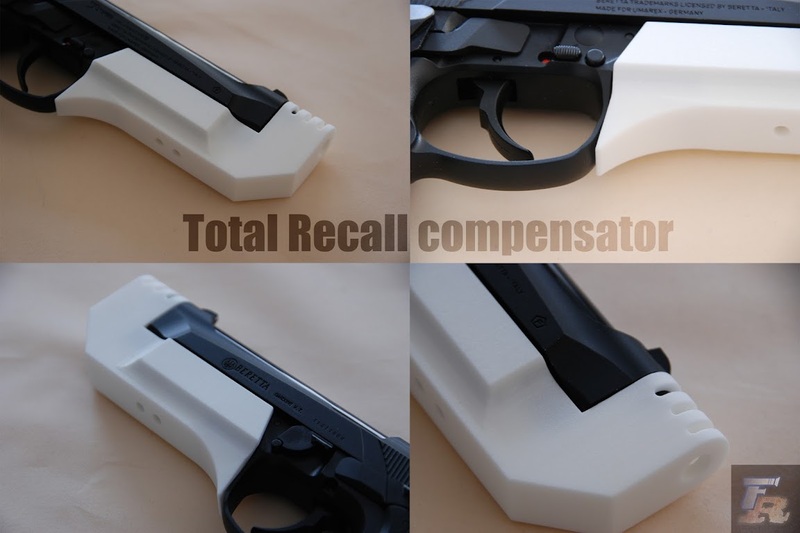 The compensator model was tapped with an M5 threading bit and fitted onto the Beretta. At this point the place where the set screw holes in the Beretta needed to be drilled was determined also. Next up is gun bleuing the set screws and looking for the right kind of black to spraypaint the model and i'm done. 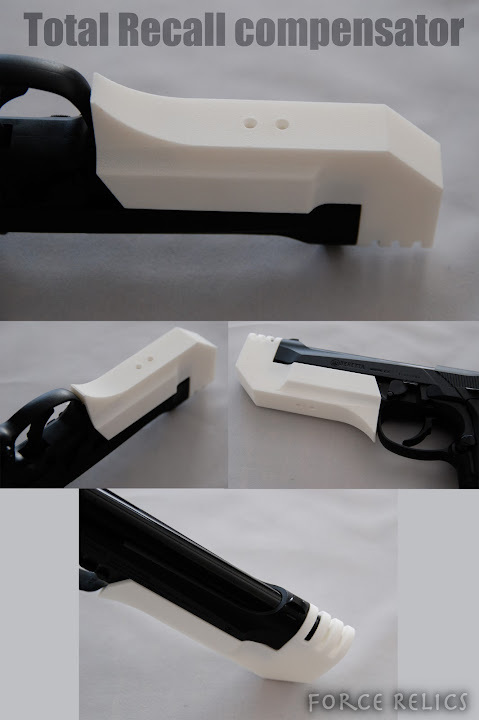 Excellent work Ki-Djowac (I didn't see the gun on the first pic you posted ) Did you use Shapeway for your 3D piece? Sounds good! 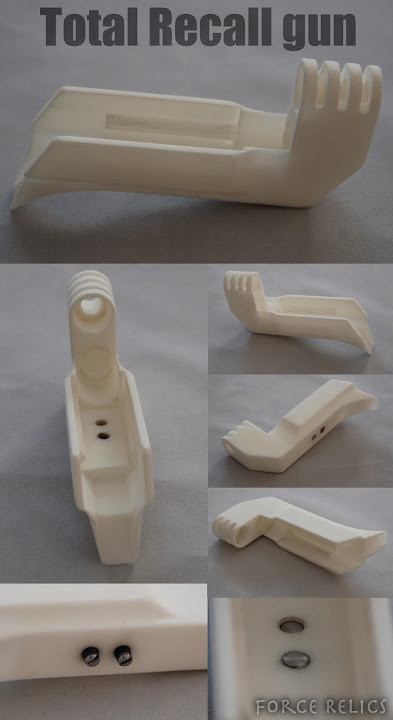 How was the finish on the Shapeway piece?...not too much sanding I hope (apart from the stuff you re-modeled). Finish was good. Apart from re-modeling i noticed that some lines were printed lightly and they had to be sanded regardless. This would have been minor sanding though. I'm going to re-model the design and order another one, but i expect this is the case every time. Still very durable and strong stuff though so i don't mind the minor sanding that much. got the V2 prototype to a finished state just to see where the color scheme would take me and how the screws would look in the design. I tried a sidegloss black, but that was a bad call on my part. What you see is a flat black and compliments the gun alot better. It took me a couple of layers of flat black with the necessary sanding jobs of 600grid in between layers. The look of the screws was achieved by using gun bleuing techniques. 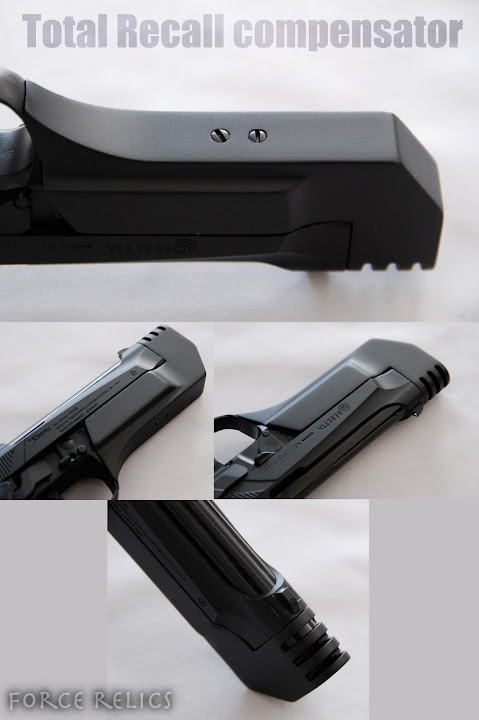 Basically purchased a gun blueing kit on e-bay and blackened the screws with it. After this was done, V4 was printed and we're almost there. I overdid the trigger guard adjustment in the design and it needs to sit a couple of mm's back towards the trigger guard. Need to try and maintain that straight corner cut that is seen in the print screen pics. Rest of it seems to be done at this point. 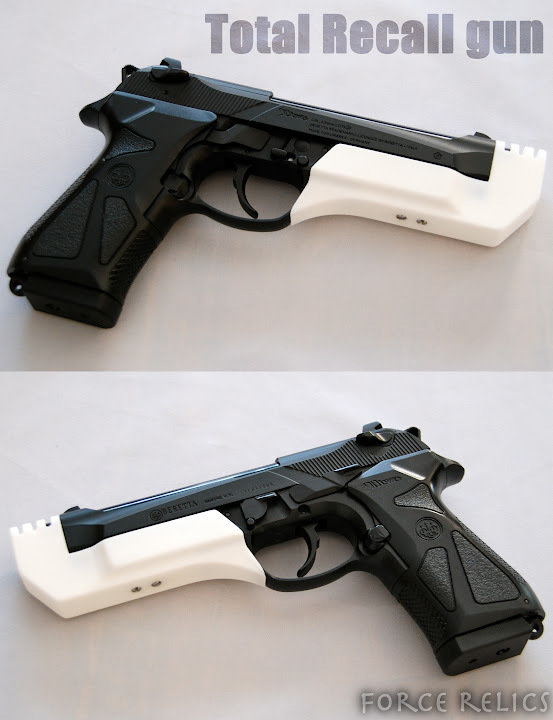 Most excellent job on that one Ki-Djowac Like the 1st version (trigger gard is hugged by your add-on). I then looked at other screen cap on line and noticed that, in the movie, the add-on piece is not tight against the gard(like your 2nd version). I went to Brussels to visit my family in early October and I was still amazed how easy it is to buy gun replica/airsoft. If I had known I would've bought the same weapon(impossible to find it here in Ottawa, Canada ). 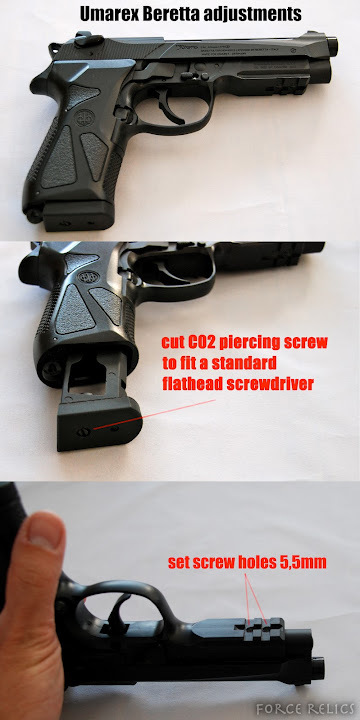 True, in Belgium we can import/buy airsoft/CO2 guns without too much hassle. Although stores for this are spread thin. I bought the one you see in the pics in Oostende at the coast. Very small shop, but filled from the ground to the sealing with collectables and a section of CO2 guns and airsoft replicas. small corner shop at the end of the main shopping street. Paid about 120 € at the time i believe. V5 came in yesterday and i must say, we're there. I'll put pics up soon. 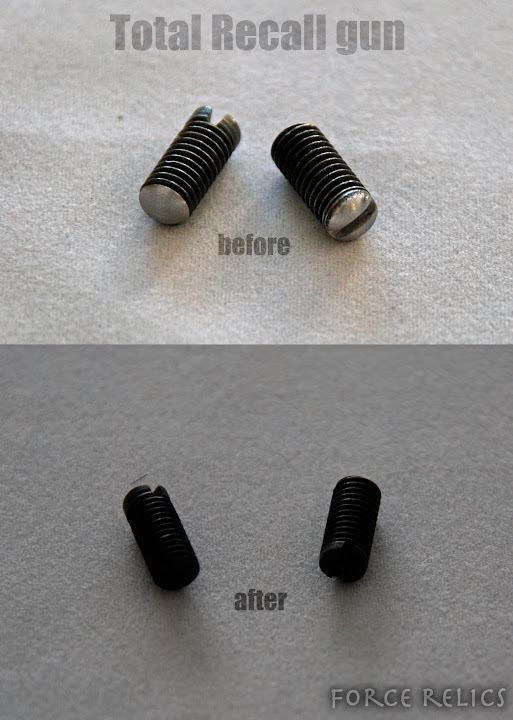 75 € + shipping for a pre-fitted, pre-sanded, pre-threaded + 2 blackened custom set screws. 120 € + shipping for a completely finished version which includes all of the above and 1 layer of primer followed with 3 layers of matt black. I'll be doing a run of 10 maximum or less depending on interest. Spiffy for sure Ki-Djowac Eager to see it all in black. Gonna see if i can find the time to start finalizing the prototype and announce the run soon.